I am a professionally qualified garden designer. 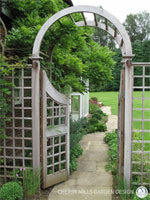 My practice in Godalming, near Guildford, is broad based and caters for family gardens through to large country estates. 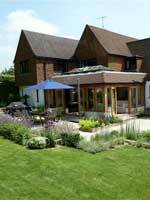 I have designed gardens for clients throughout Surrey, Sussex, Hampshire and Berkshire. 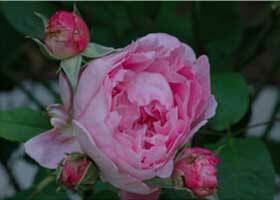 I trained in garden design at Merrist Wood College, Guildford, qualifying with distinction in 1994. I succeeded in becoming a Registered Member of The Society of Garden Designers in 2000 and am featured on the Society’s list of approved garden designers. 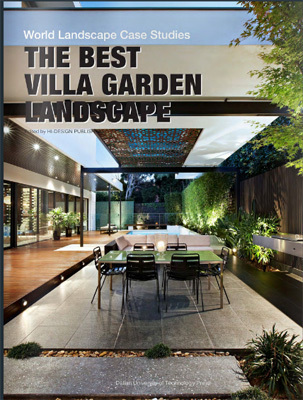 I work with experienced and reputable landscaping contractors who build my garden designs to an exacting standard. Many of my projects require bespoke features and I liaise with specialist suppliers, craftsmen and artists to provide the finishing touches for each garden design. Creating a new garden can be a daunting prospect for a home owner. My extensive experience enables me to guide clients through all stages of a project. I take the lead from them about how much involvement they wish to have during the process and I never forget that I am creating a garden for them and not for me. Many of us live very busy, pressured lives, often spending the greater part of the day indoors. Getting outside and tuning in to nature has well known benefits and can improve the quality of life on many levels. I get enormous pleasure from being in my own garden, watching nature change through the seasons and being surrounded by beautiful plants. To be able to share this experience, by working with clients to transform their garden into their own personal paradise, is a joy. 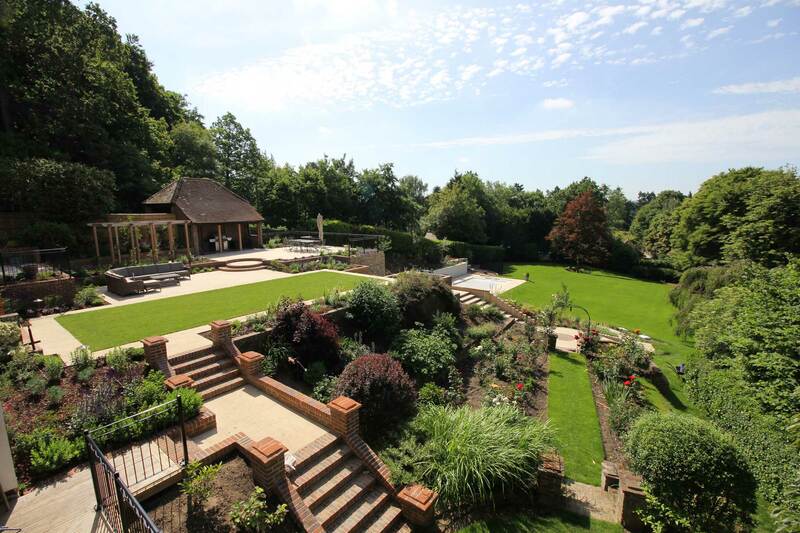 Cherry was delighted to work with Clifton Nurseries on a complete garden design for a sloping garden in Hook Heath, Surrey which won the The British Association of Landscape Industries (B.A.L.I) 2018 Award for Garden Construction. Read more about the award here. The home owner who commissioned Cherry to design this award winning garden has given Cherry this review : "Cherry is an amazing designer, who literallly thinks of everything. She is creative but also practical and can deal with complicated levels and the quirkiness of a sloping garden. Cherry is very efficient and professional when dealing with contractors. I trust her completely and found her to be a kind, hard working and inspirational person." For this series, the gardens of six deserving people were transformed by Alan Titchmarsh. Each week he took inspiration for his design from an existing garden. 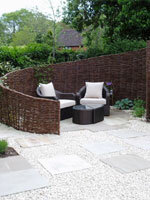 For one of the episodes he came to a garden I designed in Guildford to see a contemporary look. The garden includes hardwood decking, limestone paving, a hot tub, an enclosed seating area, a bubbling water feature and lots of planted containers. The garden works on different levels and provides a smooth link with the beautiful open sided kitchen of my client's house. The lawned area beyond provides ample space for children's games. Take a look at the photos of the garden in the Portfolio section - Multi Level Family Garden, Guildford. Hi Cherry, Just wanted to thank you for the fabulous work you have done on our front garden. You have completely taken on board our ideas, guiding us when necessary, and have more than delivered - we are absolutely delighted! Thank you so much for your patience, help and expertise. Cherry is an amazing designer, who literallly thinks of everything. She is creative but also practical and can deal with complicated levels and the quirkiness of a sloping garden. Cherry is very efficient and professional when dealing with contractors. I trust her completely and found her to be a kind, hard working and inspirational person. Hello Cherry. Thanks for your advice and continued involvement in our garden project. The new plants are lovely and your design has drawn many positive comments from family and friends. One even said "it's the sort of garden you'd find in Hampstead". Praise indeed (although I'm quite happy to live in Weybridge!) Best wishes. Dear Cherry, You may recall that back in the winter of 2012 you provided my husband and I with a design for our cottage garden in .. Lane. 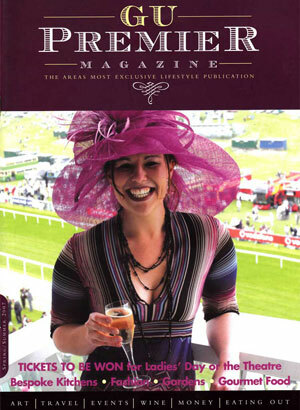 We are absolutely delighted with the outcome. Particularly given the summer we've had so far, but also throughout the year, we have used the space endlessly and our whole way of living in the house has changed for the better as a result. We regularly sit in the snug, sofa area (which is exactly what I wanted) and marvel at the layout that you set out and the transformation it created. It is stunning. I am only sorry it has taken this long to write to thank you but the sentiment is very sincere - thank you. ‘We moved house last June, from a garden that we had completely created over the course of twenty years out of a large plot of completely bare earth . We had not expected that we would be faced with a similar task when we moved South , to be nearer the family. This time there was a plot laid completely to grass, on a very sloping site, which tapered to a point in one corner. We are both keen gardeners, but did not want to wait so long this time before we had a garden that looked established, with some largish trees, lots of mixed borders , an area for fruit and veg, some seating areas, somewhere for my whirligig(I love drying the washing outdoors) a greenhouse for overwintering tender plants and raising seeds, a rose garden, water feature, a decent sized lawn to set it all off and a big hedge to give us some privacy. Not to mention a very long list of plants that we insisted we had to have. Quite a lot to get into one garden all at once, but Cherry managed to get it all in , and has created a very pretty garden for us, with plenty of potential for us to continue to develop it further, as well. Cherry came for an initial consultation and asked us a lot of questions about the type of garden we wanted, what use we would make of it, and came up with an interesting outline design, We liked her initial plan, so decided to ask her to go ahead with a detailed design. She used the slope to give us a terraced area of raised beds for the veggies, and then levelled most of the rest of the garden, giving us lawns with plenty of mixed borders , the formal rose garden incorporating the water feature, as well as the most elegant area for a whirligig that I have ever seen! She also suggested we had a lot of the sandy soil replaced with loam and well-rooted horse manure, to give us the ability to grow the lush borders we hope for. Cherry found us a great contractor and oversaw the whole project from beginning to end. She produced a very detailed planting plan, with some great plant combinations in the borders. She sourced the majority of the plants, and came and set them out for planting. Cherry was efficient, charming and helpful throughout , and did a very professional job. We are very pleased with the result and looking forward to enjoying working and relaxing in our garden. Cherry, thank you for all your hard work and beautiful design for our garden. Hi Cherry, The garden looks fantastic and it the flowers have come out! I'm happy for you to use photos in your submission for the outdoor kitchen article. We are delighted with the garden, it's better than I had imagined it could be! We had my birthday party on Saturday and everyone loved the garden and nobody could believe it was any smaller, in fact quite a few people thought it looked bigger than pre the extension. You are a genius! Thank you so very much for designing us such a gorgeous garden and one that I know we will enjoy for many years to come. We are delighted with the garden which has evolved from Cherry's design and planting plan. Our original brief to Cherry meant she had to meld some quite disparate desires into a unified whole while accommodating all sorts of awkward needs, such as ensuring the washing line could not be seen from the house, along with retaining certain trees and features which were either attractive and merited keeping or were too costly to remove. Then, to make it even more complicated for her, we stressed we wanted a garden which would be low maintenance. Despite the challenges she created a garden which is a constant pleasure to us and which can make me feel quite proud when it is admired by visiting guests. I think what Cherry has achieved for us can be summed up by one recent visitor's remark on learning that our garden had been professionally designed, Yes, of course, I can see that now; your garden displays the perfect harmony which can only come about when someone with an artistic eye for colour, together with a botanical knowledge of plants, has been at work. You must be thrilled with it. 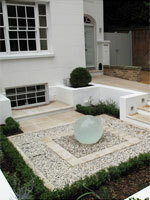 We have never enlisted the help of a garden designer before and were not sure what to expect. We were slightly worried that we would end up with a garden which looked as though it had been imported from Chelsea but was totally impractical and not ours! From the first time we met Cherry we could tell that she was going to be professional, efficient and we would be able to trust her judgement. We spent a long time discussing what we wanted to achieve, how we wanted to use the garden, our likes and dislikes. The garden is not huge but it did have quite a few elements which made it rather tricky: new extension to the house; awkward slope; bee hives; improved security required; overlooked by neighbours; deer problem; wanted water feature but no fish; needed large outdoor entertaining area; existing greenhouse; existing summerhouse... Cherry took careful note of all of this, she relished the challenge of making the maximum useable space and working out levels from our sloping ground, always with an eye on the aesthetics. She was also keen to learn what the requirements would be for the bees! The result is a beautiful garden which is practical, ticks all the boxes and feels as if it is our garden if we had the skills this is exactly what we would have planned! Later in the process we spent time discussing the plants we prefer. We are not experts in this field by any means but Cherry interpreted our thoughts into something which would work and she came back with a beautiful planting plan ‑ the plants are now in the ground and we look forward to seeing the garden grow and develop over the next few years. Hi Cherry, Your ears must have been burning recently because we’ve received so many comments about the garden and have been singing your praises at all and sundry. We have really loved watching the activity in the top bed, which is still in full bloom! I cannot believe the giant strip of bare earth now looks like a mature bed and that any concerns about all the ‘gaps’ were unnecessary.Yes, I know you told me so!! Anyway, a huge thank you as it is looking absolutely wonderful. Dear Cherry, We are very happy with the garden. Thank you. Dear Cherry, I would just like to say thank you once again for creating a fabulous garden for us all ‑ with your creativity and the hard work of the guys it has been a complete success.Please drop in any time, would love to see you ‑ good luck with your next project. Dear Cherry, The garden looks great and we are very pleased with it. Thank you very much for all your endeavours. Dear Cherry, We would both like to thank you for the very pleasant and professional way in which you have worked with us and fitted round our various requirements and for helping create something very special from that patch of bare earth! Should you ever need a recommendation from a satisfied customer, please do not hesitate to ask.